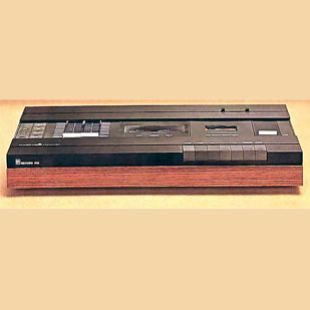 Beocord 1700 was a high-fidelity cassette recorder which combined quality with the convenience of compact cassettes. The tape-heads in Beocord 1700 were high density ferrite heads which offered high sound quality and a longer useful lifetime than any other type of tape heads available in the mid-1970's. There was a push button for switching between chromium dioxide and normal tapes in order to secure the best performance from either type. There were two VU meters with dB scales: one for each channel. Recording levels could be accurately adjusted by using the two independent sliders for right and left channels. There was an automatic stop at the end of the tape. The 3-digit tape counter had a supplementary memory function which automatically stopped the tape at a '0' reading. Sockets for mono/stereo microphone and headphones were hidden under a sliding panel on the top of the unit. Frequency range was 30-14.500 Hz and signal-to-noise ratio was better than 52dB with chromium dioxide tapes. This figure could be further improved by the Dolby noise reduction system which was available as an optional accessory. The plug-in unit fitted inside the cabinet and after the necessary adjustments, the "filter" button was replaced by a "Dolby" button which was used to switch the system IN or OUT as required. Wow and flutter was less than ± 0.12 % (JIS) or ±0.2 % (DIN). Beocord 1700 could be used as part of Beosystem 1700 together with suitable speakers.